Firefall has one of the worst openings of any MMO I’ve played. It should be an opportunity to show Firefall’s ambition: an open world action game in which you, a jetpack and a rocket launcher fend off waves of bugs and aliens. But all Firefall’s opening does is shove your face right up against grubby textures, shoddy animations, and invisible walls. Your first two hours with it will see you retreading ground completing repetitive fetch quests for characterless NPCs in a world that does nothing to excite the eye. You have to wade through that swill of a beginning to understand Firefall’s potential. Firefall’s sell is that it wraps all the trappings of a modern MMO – raids, crafting, and loot drops – into a sci-fi shooter packed with jet packs, alien bugs, and dynamically generated missions. Since it was first announced back in 2010 developer Red 5 Studios have been thrilling us with colourful visuals and a beta that showed a free-to-play MMO that was confident to diverge from the model set down by World of Warcraft a decade a go. If you play Firefall long enough, hints of that confidence remain. But it’s been hidden well. Red 5 push you into the world of Firefall through a sort of showcase mission. Your dropship has crashed near Copacabana, the first hub town of the game, and you need to get to a ship to evacuate. 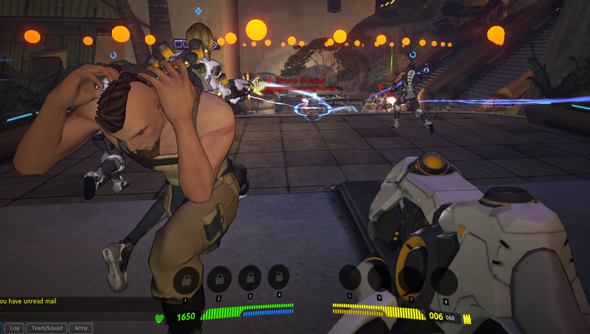 You’re guided down a tunnel of scripted events meant to show off the game’s different battleframes – armoured suits that act as Firefall’s different classes. Though, if you stop for a moment you see that all the action is repeating on a very short loop. Look closer and you’ll spot that some of the civilian NPCs who run past you have their arms raised as though they’re carrying an invisible rifle. Deviate from the path you quickly find invisible walls, and you’ll discover enemy aliens that completely ignore you. It immediately makes Firefall feel lifeless. It makes you realise how unnecessary you are to the game world. This is not what MMOs promise. Firefall has a sort-of class system, expressed through the type of armour (battlesuit) you’ll wear. There are five in all, the Assault, Biotech (healer), Dreadnaught (tank), Engineer, and Recon. Each has four different abilities and a different primary weapon. For the Assault that’s a six-shot blaster that fires explosive balls of energy. For the Engineer it’s a plasma beam. There’s also a perks system that unlocks when you reach level ten. These are passive abilities, like a 20% reduction in bullet damage, that can be slotted into your battleframe. As you level through the game you gain access to a lot more perks than you can fit into your frame so you have to choose to specialise. One neat way in which Firefall diverges from the MMO norm is that Battleframe’s are interchangable, by swapping them out at a garage, essentially changing your class. You’ll need to level it up separately but your inventory moves across with you so there’s little pain for trying out how the other classes work. Actually, that’s not completely true. There’s a great deal of pain. Firefall’s got two huge problems. One: It’s a grind. Two: there’s just not enough to do. The game is obtusely limited. With only one faction, the ARES mercenaries ridding the earth of alien invaders, there’s only one starting area, and only one set of quests. If you’re looking to level up a spare battleframe, you’ll need to repeat quests or grind. The quest’s are bad: at least to begin with. They are staid, and lifeless. You’ll be told to go to a place, loot a box/talk to a person and shoot the aliens before going to another place to loot a box/talk to a person before either going to another place and repeating or heading home. The lack of imagination is depressing. Seriously: one quest chain has you rescuing family members: one quest for “Distraught Wife”, another quest for “Distraught Mother”, and finally a quest for “Distraught Father”. Oh, and the quests start and end at the Copa disco, the natural go to spot for families in distress. As you get to the higher levels repeating missions becomes less of an issue: you find there are multiple quest hubs with missions for your level, giving more variety, but that only goes so far. If you were to try and level a third battleframe up then you’d quickly run out of new things to do. And there’s a whole lot of walking: missions will take place a kilometer away from your current position. To complete the quest you’ll want to trudge back, and then home, and then back again for the next stage. The designers obviously see the problem: at ARES bases you occasionally find glider pads that can shoot you into the air to glide a few hundred metres. Unfortunately that only helps you getting to a mission, not getting back. It’s only at level 25 that you’re given your first mount: a motorbike. That’s 22 levels too late. I found the treking so frustrating that, after over 10 hours, I finally gave in and bought the bike from the in-game store. Firefall used to be busier, hence the space. The game tries to use dynamic, unscripted events to pave over the dull quests. A drop pod full of gnarly alien Chosen might fall to the ground near a human outpost, spawning a mission marker on the minimap and calling for nearby players to drop what they’re doing and come help, or a rebel cell might be found in one of Copa’s warehouses and you need to break in before they attack the city. But that design didn’t work, the frequency of the dynamic events was dramatically reduced during the game’s (lengthy) beta, and there’s nothing been added to replace them. Thumping is Firefall’s weirdest system. You’re given a hammer that lets you take a seismic reading by smacking the ground. When you hit a mineral vein you can call down a Thumper, a orbit dropped mining probe that draws out valuable materials by thumping the dirt. Thumping takes around five minutes, but will draw out a steady wave of Aranhas, Firefall’s arachnid enemies. It’s like a portable horde mode. It’s also dull as ditchwater. Enemy AI in Firefall is basic. Aranhas spawn and run at you, making no use of cover or acting as a group. Combat’s usually a matter of jetpacking around so none of the melee enemies can hit you while you pepper the ranged foes with your guns. Stronger thumpers mean stronger waves and stronger rewards. It should also mean players work together, but they don’t. There’s no communication, just the thumper owner and anyone who happened to wander across the swarm blasting away at brainless AI. And that’s Firefall’s other crippling flaw. There’s just so little reason to play together. In my 20 hours with the game I’ve not once had to form a party to complete a quest. The only times I’ve evenly remotely come close to a party is during the game’s inept campaign missions. And they’re not much fun. These missions see you thrown into an instance with other players who are on the same task. They have harder enemies, and theoretically require some teamwork. It doesn’t happen through. Everyone goes off on their own, same as before, whittling down the swarm of feckless enemies. Thumping also reveals how pants the crafting system is. Each human base has a workbench where you can spend resources acquired from salvaging gear, thumping, and quests to research new kit for you to craft. The problem is that it all requires a massive outlay of resources for items that are no better than the ones you’ll find while grinding through the game. It makes the whole system a waste of time. Firefall’s been in development for years and it’s changed a lot in that time. Originally the MMO had a PvP focus but now that side of the game is locked off till you get past level 30 and, even then, it only takes place on a separate island. You can never escape the fact that despite having now officially launched it feels unfinished. There are practically no tutorials to introduce you to crafting, how to get vehicles, the item market, even the perks system. You could easily walk through Firefall not knowing anything about these subsections of the game. There are bugs, too. Starting a quest doesn’t always spawn the necessary objectives till you logout and back in again, the next section of your quest can fail to load, and you’ll find the frame rate can drop even when there’s little going on on screen. You’ll see enemies getting caught on objects or just clip straight through them. At other times you’ll walk into a clearing only to find all the objects spawn a moment later and drop to the earth. They’re not game breaking but for a game that’s been in beta for more than two years it’s unacceptable. All these problems could be fixed in the coming months – the bugs can be patched out, quests can be rewritten and made more varied and lively, crafting can be balanced to make it worthwhile, and the number of dynamic events can be increased. Something can be done, too, to encourage team play. But, until then, there is no reason to start playing.